Photo: Henry Antes House, ca. 1736, Colonial Road, Upper Frederick Township, Pottstown, PA. Listed on the National Register of Historic Places in 1975. Designated as a National Historic Landmark in 1992. Photographed by User:Smallbones (own work), 2011, [cc-by-1.0 (creativecommons.org/publicdomain/zero/1.0/deed.en)], via Wikimedia Commons, accessed December, 2013. Montgomery County Courthouse is located at 2 East Airy Street, Norristown PA 19401; phone: 610-278-3000. See also: Montgomery County Architects and Architecture. Created on September 10, 1784 from part of Philadelphia County. Named perhaps for Montgomeryshire in Wales, for the Revolutionary hero Gen. Richard Montgomery, or for two legislators named Montgomery who advanced the bill to create the county. Norristown, the county seat, was laid out in 1784 and incorporated as a borough on March 31, 1812. It was named for Isaac Norris who owned land there. Settled since 1685, the first residents were Germans, mainly pietists, in Germantown. Welsh, Scotch-Irish, English (mostly Quakers), and Swedes flocked to the area. The opening of the Schuylkill Canal in 1825 boosted the economy, followed by railroads. The Pennsylvania Railroad's Main Line passed through in the 1860s, giving rise to an elite residential area, "the Main Line." Intelligent farming has always been practiced on the county's good soil. Iron works arose in Norristown, Pottstown, and Conshohocken, and leather tanning was very important until the 1930s. Bernard McCready began a large textile factory in Norristown in 1826, with an enormous factory. Cigars, carriages, and paper were nineteenth-century Montgomery specialties, and marble is still quarried. From about 1900 to the 1970s steel, machinery, textiles, rubber, electrical, chemicals, and paint manufacturing were strong. The county is still a manufacturing giant. In 1992 it had the highest "value added from manufactures" figure of any Pennsylvania county. This was an amazing 9 1/4 billion dollars – more than double the figure for any other county. In addition, much personal income comes in from residents who work in Philadelphia. The county has the highest personal income rate and lowest percentage in poverty of the sixty-seven counties. Eighteen percent of the land is still farmed, and the county ranks eleventh in cash receipts from field crops. Both Republican Gov. Hartranft and Democratic presidential candidate Winfield Scott Hancock were natives. The Indian Valley is located in the north central section of Montgomery County. It includes the four townships of Franconia, Lower Salford, Salford, and Upper Salford and the two boroughs of Souderton and Telford. These six municipalities comprise a region nearly 49 square miles in size. As little as 25 years ago, the region was an undeveloped, rural area with many working farms and a few small villages. While a good portion of the Indian Valley retains that rural character to this day, much of the region has changed. Growth pressures pushing outward from Philadelphia have resulted in the rapid construction of many homes and businesses on what was once open land. Similar growth and development patterns have occurred repeatedly throughout Montgomery County and the larger Delaware Valley region. The development patterns experienced by the Indian Valley region can be largely attributed to the fact that the region is conveniently located for easy access to jobs, stores, and highways. King of Prussia, North Penn, Fort Washington, Montgomeryville, and Quakertown are all within a 30-minute drive of the region. The King of Prussia area alone offers more than 30,000 jobs and has more than 2,000,000 square feet of retail space. Fort Washington and the North Penn area also offer about 30,000 jobs respectively. Quakertown and other areas of Bucks County are frequent working and shopping destinations for Indian Valley residents. The Indian Valley itself is an employment center offering approximately 3,600 jobs in the meatpacking and insurance industries alone. The number of residents living in the Indian Valley is increasing dramatically. In 1970, the region's population was 23,538. By 1990, it had increased by more than 9,000 people to 33,089, a 40 percent gain. The region has experienced rapid growth. In 2000, the region's population was 41,213 an increase of 5,845 persons between 1990 and 2000. Population projections indicate that this rapid growth will continue. Recognizing the potential impact of this growth, the six municipalities formed the Indian Valley Regional Planning Commission to prepare this joint comprehensive plan, a vision for the next 20 years. In 1684 William Penn purchased the Perkiomen Watershed from the Lenape Indians. Many of the settlers of the Indian Valley were a collection of Rhineland Germans and Swiss. The Indian Valley got its name from early settlers who noticed that much of present-day Franconia had an abundance of fertile farmfields which were cultivated by the Lenape Indians. The early settlers called these fields "Indianfield." By 1853 the old paths of the Indians and settlers were intersected by a north-south railroad. With the railroad, boroughs developed quite rapidly with mills, warehouses, businesses, institutions and residences. Souderton and Telford became the hub of the Indian Valley. Many young people migrated off the surrounding farms to look for work in their many mills and factories. 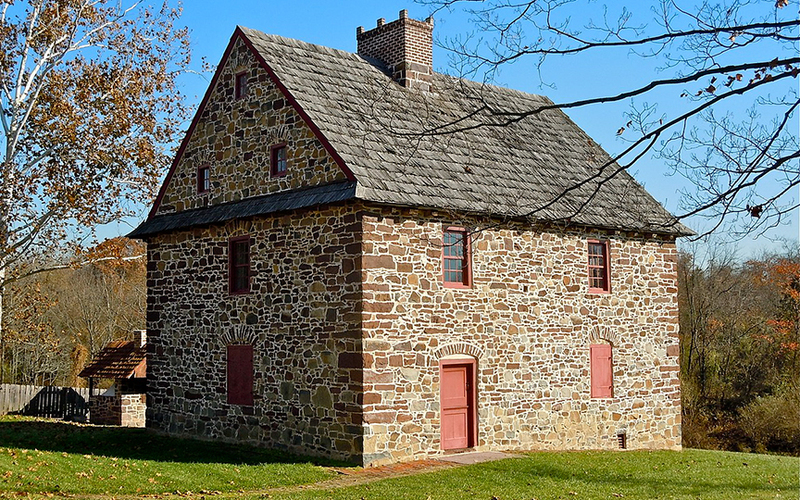 Souderton became well known for its clothing mills and cigar factories. By 1909 Harleysville developed as a center of commerce with the opening of the Harleysville Bank and then in 1915 the Harleysville Insurance Company. After World War II the clothing industry began to decline, and the boroughs began to suffer. However, work was to be found just south of Souderton as some of the larger farm families in the valley began building plants to process their foodstuffs. A cluster of plants as well as an auction center began to evolve through Souderton and into Franconia. Today the Indian Valley is growing, yet much of the employment base and community traits remain the same. Growth is seen in new housing subdivisions in Franconia and Lower Salford; expanded headquarters operations in Harleysville and Souderton; as well as the growth of institutions within the Indian Valley.